Fed up of having bland staple denim hanging lifelessly in your wardrobe? Well, we’ve got the solution! Take a look at our raw denim guide and discover how you can transform the humble denim item into something totally unique and completely you. It’s safe to say that denim is a staple material found in just about anybody’s wardrobe. It’s simple and timeless, not to mention totally versatile. Whether you’re wearing it for a formal or casual occasion, in jacket or jeans form, denim is the epitome of cool comfort and will forever remain a classic. But is your denim really doing you justice? Are you copping out? If you’re the kind of guy that lives life to the full (and likes to show it), then raw denim is an absolute must-have for your perennial wardrobe. If you want to be super specific, you will probably find that a dictionary defines denim material as: a heavy, Z-twist, twill cotton for jeans, overalls, and other work and leisure garments. Effectively, denim is formed of a cotton twill textile that is woven in a specific way (where the horizontal threads pass under two vertical threads). The vertical thread is dyed (commonly with Indigo dye) so the colour features predominantly on the surface of the fabric with the horizontal thread (commonly white) acting as support. With denim remaining so on-trend year after year, it's worth taking a brief look back to understand just how denim has risen to such adoration over the years. Denim was used in work-wear as early as the 17th century in professions that involved physical labour, such as railroad workers and minors. The material was chosen due to its strength and its durability and well as the Indigo dye being used to help conceal dirt. In 1873 Levi Strauss & Co were granted a patent number for their pattern that strengthened the stress points on riveted blue denim pants. This ultimately became the stepping stones for the denim business today. In the 1920's, denim was worn on screen in Hollywood Western Films. This prompted an interest in denim that wasn't simply owing to it's functionality, with young boys wanting to dress like their Cowboy heroes. During WWII, many workers wore denim in factories whilst contributing to the war effort. 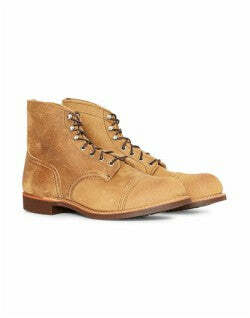 Soldiers too wore denim when not on duty, further boosting the acceptance of denim as casual wear. 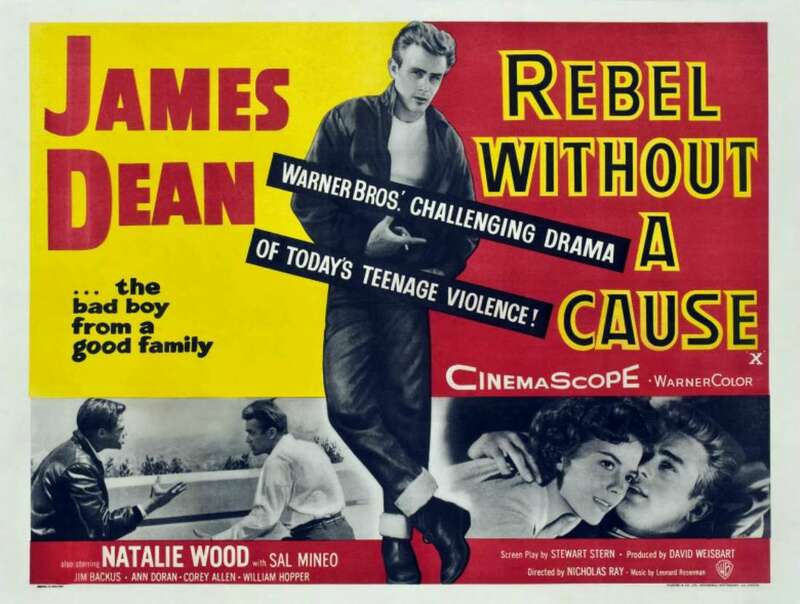 Denim was finally given a full welcome, when movies such as: 'Rebel Without a Cause', and Elvis Presley's infamous 'Jailhouse Rock' became an instant hit with the masses, who in turn embraced their idol's style. Raw denim is a bit different to your standard shop bought denim as it doesn't go through all of the washing and distressing that other pairs may go through. The raw denim comes straight off the loom, made into the jeans and given straight to the consumer. It's not altered of washed in anyway, meaning that's all up to you. This is why buying, caring and wearing your raw denim is different and more complicated than just buying a usual pair. Before the 1970's (when cheaper and quicker alternatives for producing denim were developed), all denim was 'raw' and 'selvage'. It's the concept of wash that really defines raw denim and separates it from other denim pieces that are pre-washed or pre-distressed. With pre-washed denim, once the shape of the denim has been formed, it goes through a washing process whereby the dye fades and the material is loosened, making it more comfortable to wear. In this process, the denim may be given an artificial worn-in appearance through a particular wash (such as acid-wash), where sanding or acid and abrasives are used to treat the material. 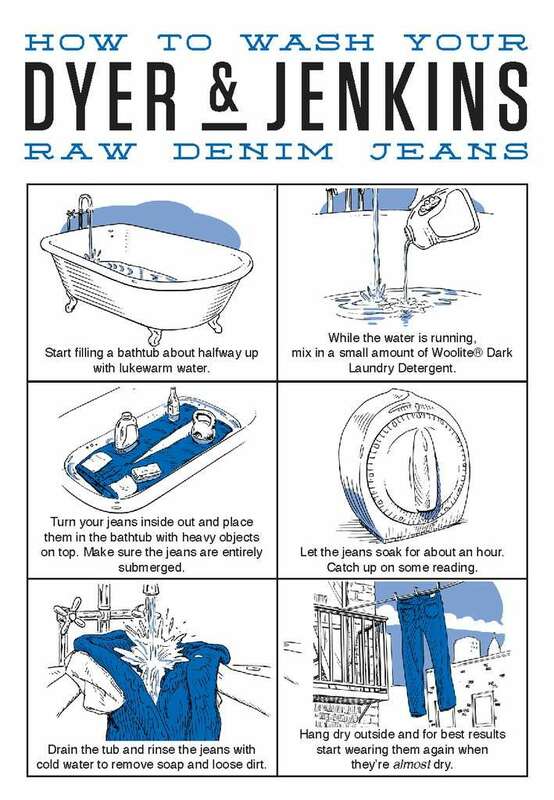 Raw denim, however, simply does not go through this washing process. This is why raw denim is often a lot more rigid and sometimes referred to as: dry denim. As it is untreated, the dye still sits heavily on the fabric, so all the general wear and tear that gradually appears on the material is authentic. It's an eco-friendly and labour-friendly option (due to the minimal amount of water and chemicals used in its production, in comparison to pre-washed garments). As mentioned in our brief history of denim, original denim items were both 'raw', and 'selvage'. 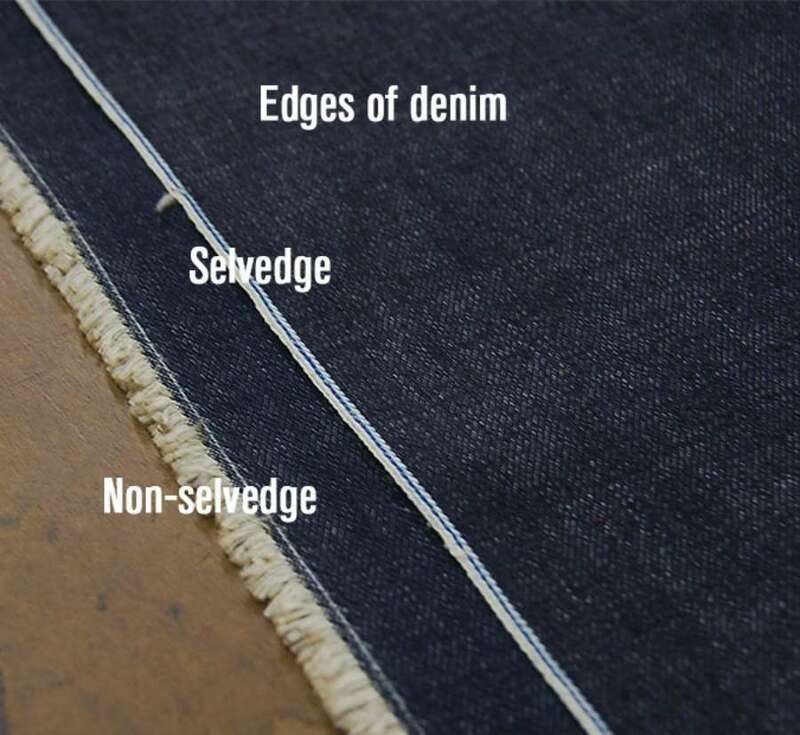 The term selvage, refers to the edge of the fabric and the way in which the denim material has been woven, usually on shuttle looms, to avoid fraying. This is the traditional, or shall we say: 'vintage', way of constructing denim. Unlike modern processing techniques, the selvage technique is generally more time-consuming and expensive, and results in a denim material that has a dense weave. The material is more rigid and is often associated with a higher quality. Inconsistencies in the weave due to the traditional style of weaving also help to give the raw denim an authentic and individual feel, which is often favoured by denim heads. Aside from selvage, the overall quality of a denim garment can usually be judged by the cotton used and where it is made. 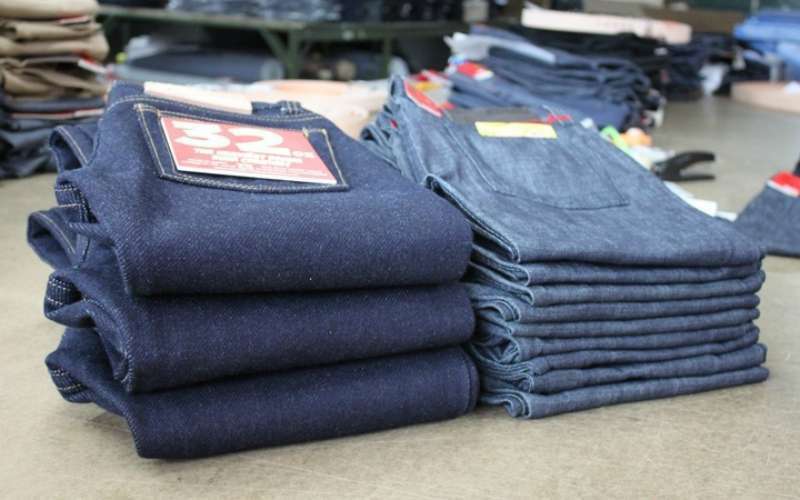 In the production of denim you'll find that the material is either sanforized or non-sanforized. Sanforization is a process in which the denim material is shrunk (without using a washing process) prior to it reaching the buyer. This reduces the amount of product shrinkage on its first wash. 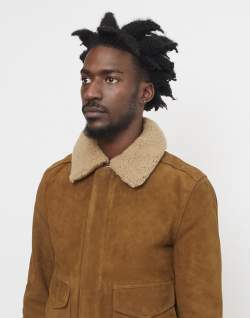 Therefore, if you see a raw denim item that displays 'shrink to fit' on its label, you can safely assume that it is unsanforized. Unsanforized raw denim can shrink by up to 10% on its first wash, so it is advisable to opt for a size or two bigger than your usual size. Prior to its first wear, it's pretty important that you soak the item to allow the raw denim to do all of its shrinking - then you're ready to go. If your raw denim purchase is sanforized, then there's no need to soak it. On its first wash a sanforized raw denim item will shrink by about 1-2%. 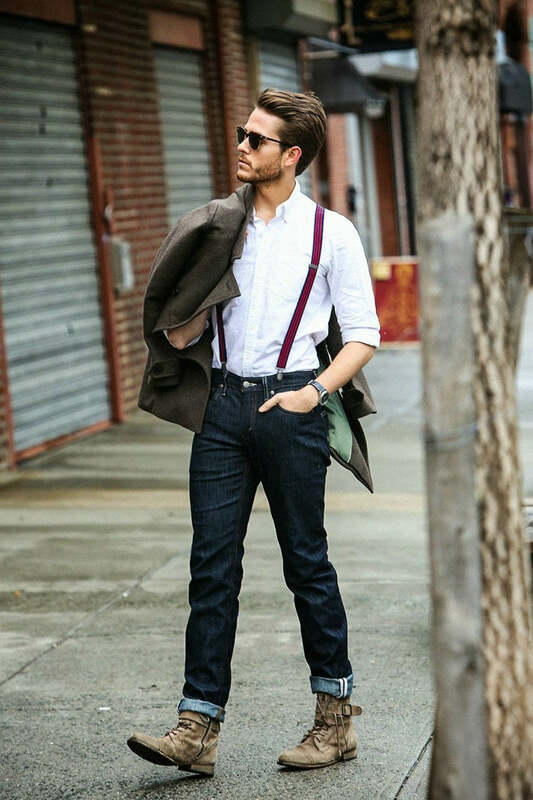 Some do suggest opting for a smaller size when purchasing sanforized denim, but overtime all jeans stretch out around the waist, so going with your standard size is also a safe option. Lightweight - around 12 oz. or under. 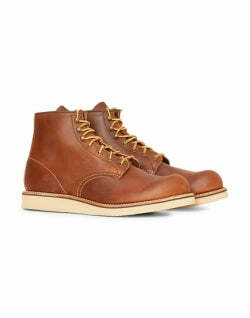 The most comfortable to wear and easiest to break in. However, fading effects on lightweight denim will be less dramatic. Mid-weight - from 12 - 16 oz. Denim at this weight can feel a little stiff and rough to begin with. This is the most popular weight for raw denim, and will generally take longer to fade than denim that is of a lighter weight. Heavyweight - above 16 oz. 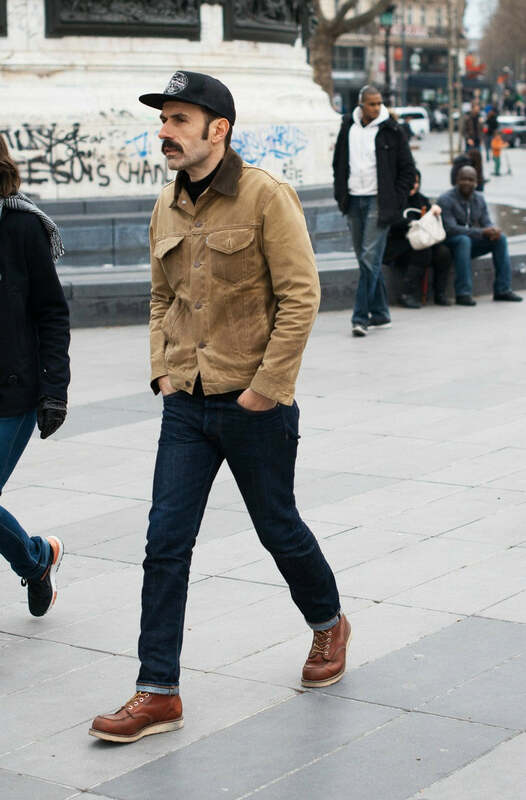 Heavyweight denim certainly takes some getting used to as it is practically immortal. You will need to invest a large amount of (slightly uncomfortable) time to really break these heavy denim jeans in, but the results will be impressive. As raw denim is not pre-distressed, breaking your items in is solely down to the wear and tear you put into them. 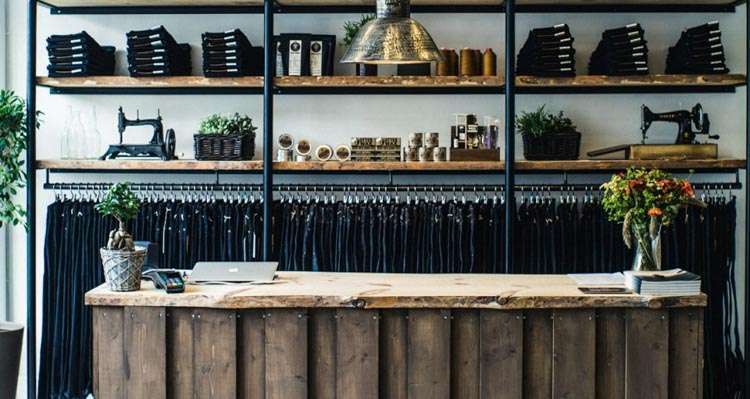 Put simply, raw denim moulds around you. Generally, any type of denim material will take a while to wear in - but raw denim can tend to feel particularly uncomfortable to begin with simply because it's not been washed or softened. To help aid the breaking in process, an initial soak before donning the item can really help. Fill a bath tub with warm water, make sure the waters not too hot otherwise the water will release some of the Indigo dye. Turn your raw denim item inside out and place it in the water for about an hour. Use bottles to help weigh it down and keep it submerged. Remove the item and leave it to air dry - a good option is to wear the item whilst they're still damp as this will help increase the stretching process if the denim is particularly heavy, but definitely not the comfiest. Because raw denim doesn't go through a washing process, the dye remains heavily in the fabric upon purchase meaning it gradually fades over time. Due to this, most owners of raw denim items avoid washing their clothing on a regular basis to try and maintain a sense of adventure and personality around the garment (allowing the dye to fade over a longer period of time). 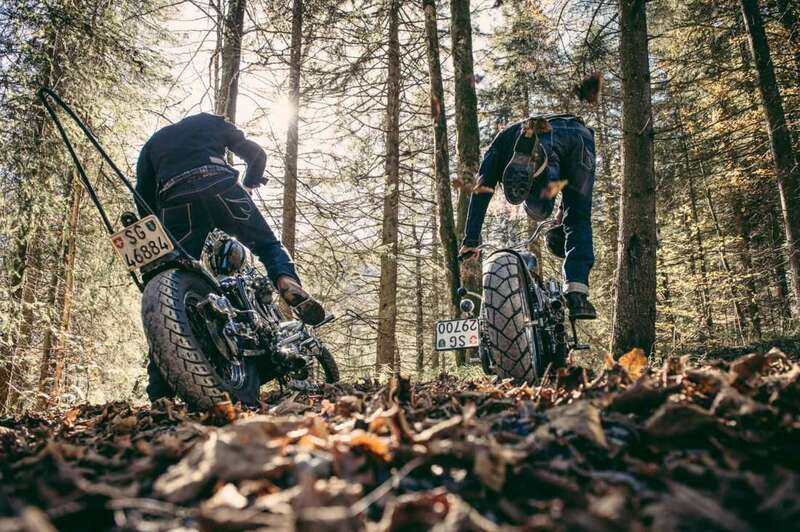 Think of raw denim as a material memoir, each growing imperfection has it's own story to tell. Perfect if you're not a diary / paper and pen kind of guy... or just really hate washing your clothes. Whiskers - where faded lines appear around the crotch area. 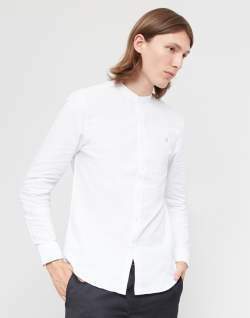 Stacks - whereby the jeans are hemmed a few inches too long, resulting in the extra fabric 'stacking' over the shoe, and fading the fabric involved. Honeycombs - where faded lines develop behind the knees. Train tracks - where the outer side of the denim (outseam) sits along the selvage and creates vertical parallel lines running alongside it. You'll probably find that most people go up to six months before they even consider giving their raw denim items a wash. When the time comes for you, the most effective way to machine wash raw denim is to keep the water temperature cool (below 30) and on a minimal spin before hanging the item outside to dry in the shade. Avoid using a tumble dryer as this can drastically alter the shape of the item. Also bear in mind that the dye has a tendency to bleed out when washing, so don't shove it in with any delicate or light colours. If you fancy the novelty of washing your items in a bathtub, you'll be joining the tradition. It's not uncommon for people to even wear their items whilst washing them. Follow the soaking instructions above and consider adding a small amount of enzyme free denim detergent to the water. Rinse them out, remove the plug and re-fill with just cold water, before leaving the item to soak for a further ten minutes. Raw denim is essentially denim that's dry or unwashed, it's not undergone any of the usual washing and distressing that your standard denim goes through. The denim comes straight off the loom and is made into products to give straight to you, it's usually a stiff, deep blue colour and will mould to you after wear and tear. Breaking in your raw denim really helps to build and develop a character around the item in question, and ultimately gets you out and about. Washing your raw denim needs some thought, the colour is prone to run and it may shrink depending on if it's been sanforized or not. 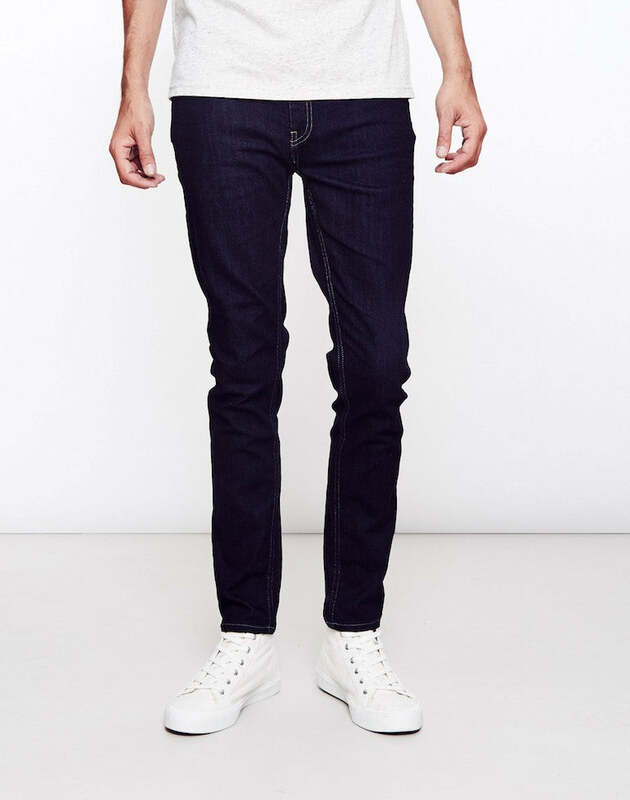 So basically, raw denim really is an investment piece, both in terms of your time and money. 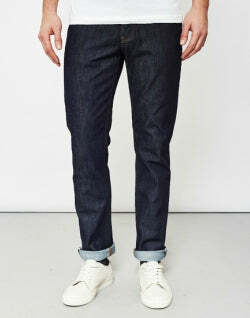 Denim in general is a quintessential classic, raw denim fuses simplicity with luxury and almost becomes a second skin. 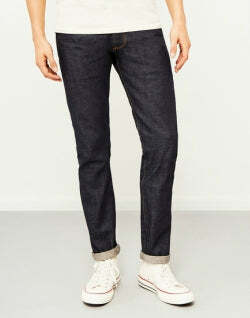 If we've failed to tempt you up till now, this denim will become one of your much loved pieces in your wardrobe. If you don't invest now you'll more than likely regret it.